Ira Gershwin knew the power of rhythm when he wrote these words to the musical, Girl Crazy. Teaching rhythm to students is one of my favorite things because after all, if you have rhythm, "who could ask for anything more"?! 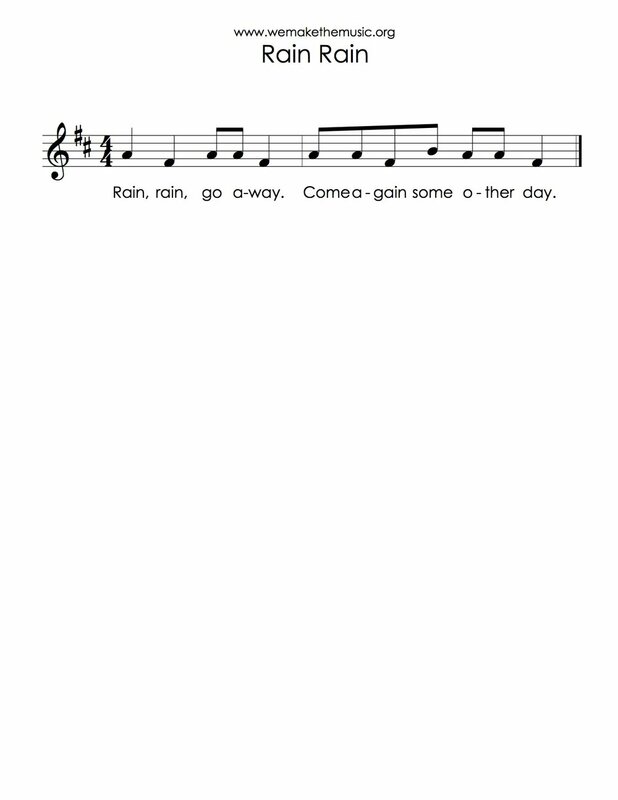 Enjoy these songs for teaching quarter and eighth notes to your kiddos! Children like this song, especially when its put into perspective. Have students look at their shoes and ask them what they do when their shoes get dirty, or get damaged. Likely, they simply buy a new pair. 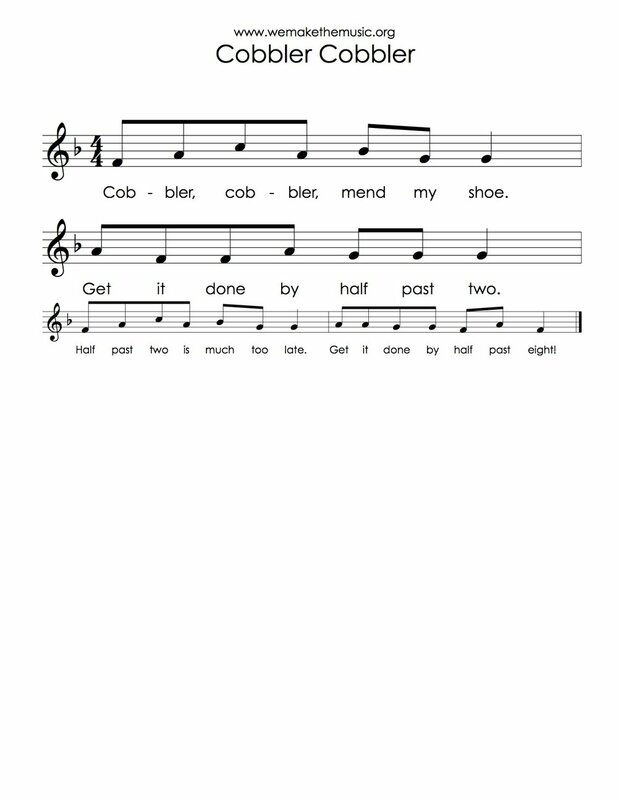 Then you can explain that when this song was sung, there was a special person whose job it was to fix shoes called a cobbler. When your shoes were damaged you would take them to the cobbler to be fixed. You can also point out that apparently the person singing the song was impatient and needed the cobbler to hurry up! Students sing the song walking in a circle and holding hands, with one child in the middle. At the words "Down Miss Mary", the child in the middle touches someone in the circle on the head. That person crouches down, but must continue to walk. Keep going until all the children are crouching, or as long as time permits. It's a hoot! This song could also be brought back in later grades to teach eighth note followed by two sixteenth (ti tika or ta dimi). This popular english nursery rhyme is a classic. 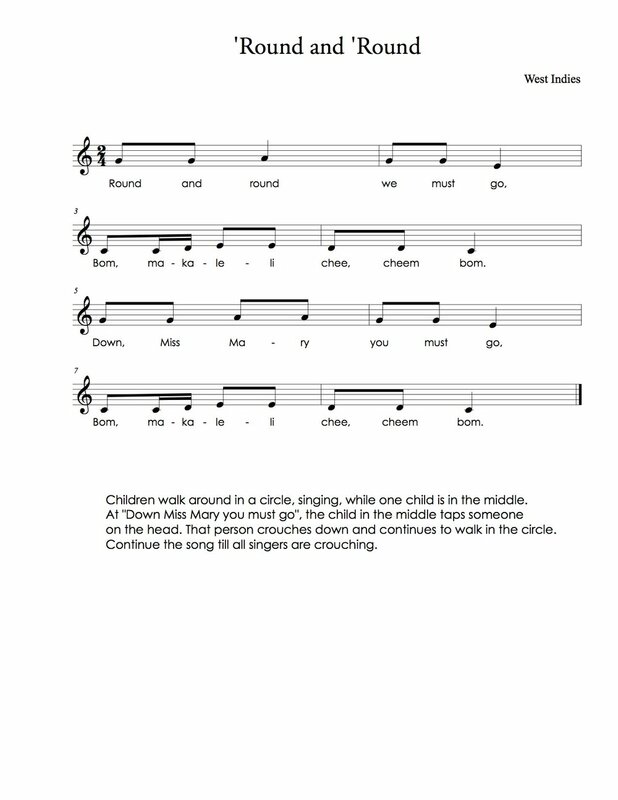 Your students will enjoy singing a song they already know! This song has some really great imagery to use as you teach it. 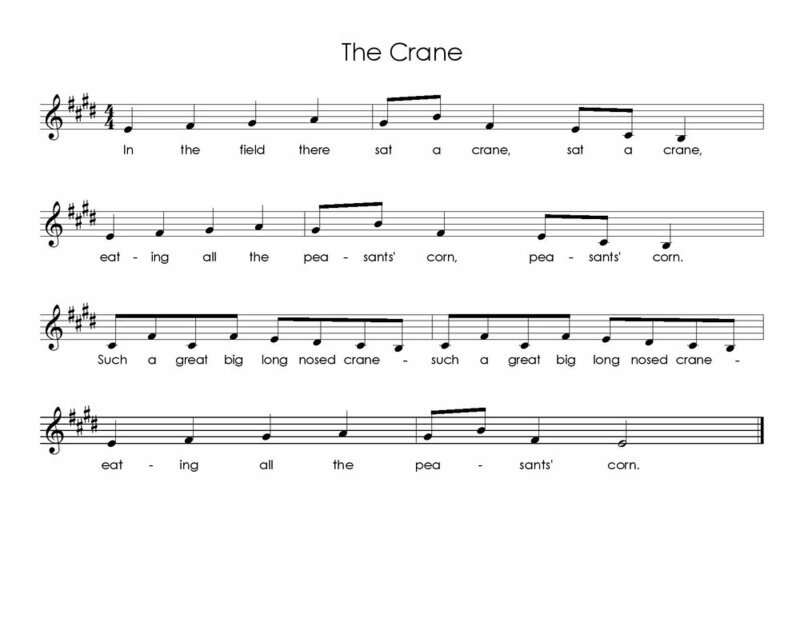 For example, you can ask students to describe what the crane looked like. What was he doing? Do you think the peasants were okay with this "great big long nosed crane" eating their corn? Students stand holding hands in a circle, arms held high to create "windows". One child, the bluebird, weaves in and out of the windows. At "pick a little partner" the bluebird choses one person from the circle. They join hands and jump in the middle (at "hop in the garden"). Then the original bluebird goes back in the circle and the new bluebird continues the game as the song is sung again. * One variation of this game has the students changing the color of the bird based on the color the child is wearing. Lesson planning is easy when you have a great selection of songs to choose from, and a game plan of how to use them. I'm always trying to make this process more streamlined for myself which is why I put together this list of songs for you to use as well! I've categorized these songs rhythmically by their first line to make it easier to pull a good variety of rhythms in your song collection.